Airwheel Self balancing scooter is a stylish, convenient, eco friendly personal transporter, was debuted in Sweden Yacht Show 2015 on Jan 31, there are three models have taken part into the show, which is X3, Q3, S3. The commonly means of transport - car, not only the huge energy consumption, but also cause serious pollution to the environment, in order to protection of resources and environment, there is urgent need to a green energy transport. Thus, Airwheel electric car came into market. This is a use of lithium ion batteries as power sources, very energy efficiency, a personal portable unicycle without air polluted. 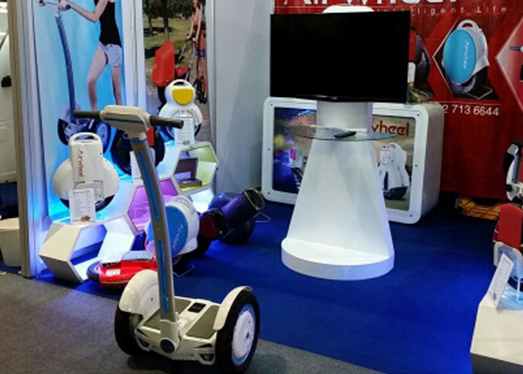 During the Gothenburg show, Sweden 2015, Airwheel electric self electric self balancing scooter X3,Q3, S3 was on the show, X3 is a single wheeled balancing unicycle features flexible and fun; Q3 is twin wheels self balancing unicycle with Airwheel’s patented technology, stable and easy to learn, S3 is two wheeled balancing scooter, matched with a 4.0 inch intelligence screen, the appearance is beautiful and comfortable riding. Compared with the existing transporter, there are lots of advantage of self balancing scooter http://www.airwheel.cn/, for example, it uses electricity, no pollution, compact, does not require special storage place, low carbon and environment protection, with justseveral unit of electric completed the travel task, convenient, and no worry about the congestion and so on. By summarize above, all showed the Airwheel self balancing scooter is a valuable personal transporter. Founded in 2013, Airwheel technology, purpose at “smart transporter for energy saving outgoing”, contributed in created stylish, convenient and eco friendly personal transporter, is an company collected by research, production, developing, take precedence of the developing of same industry, in just one year, Airwheel intelligence technology has grow into the leader of smart travel field, enter into 100 countries and applied for a trademark in more than 70 counties, become the well know brand in the self balancing scooter industry.